2014 marked the first year our Ballarat studio was up and running. One of the first projects I developed there was an edition of linocuts for Beastarium, a print exchange folio curated by Rona Green. (My print edition is pictured bottom row centre in the montage below. I collected my folio recently, and it’s a beauty). Show Time, Arts Centre Melbourne, featuring (left) my linocut See the Lady Sawn in Half! An early highlight of the year was back in January, when I was invited by the Australian Print Workshop to be one of the special Guest Artists at their Summer School. The linocut I made, Jewel Beetle Woman, was editioned by APW Master Printer Simon White. 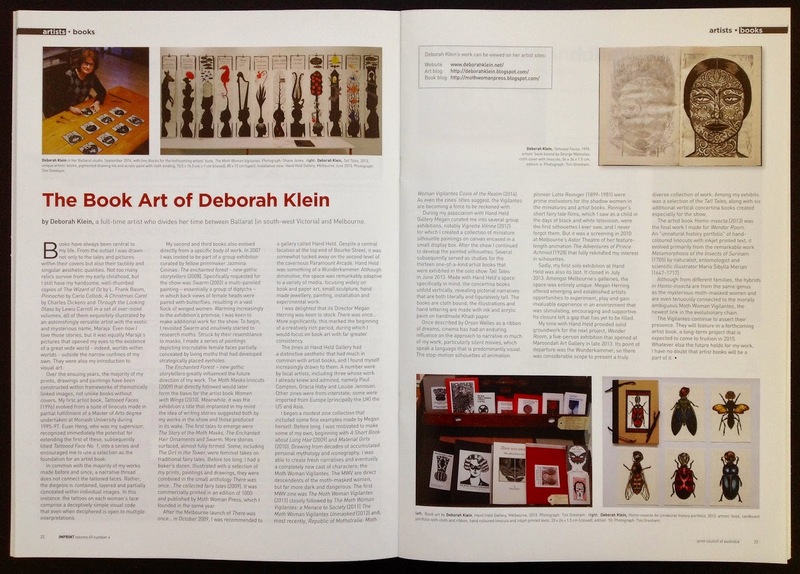 In the latter part of the year I completed a small print edition for Editions 2014, the Australian Print Workshop’s biennial fundraiser (My linocut Cotton Harlequin Bug Woman is pictured in the top montage, righthand side, second from top). My partner Shane Jones also made an edition for the show. We were both delighted to learn that our prints were recently acquired by the City of Whitehorse for their permanent collection. 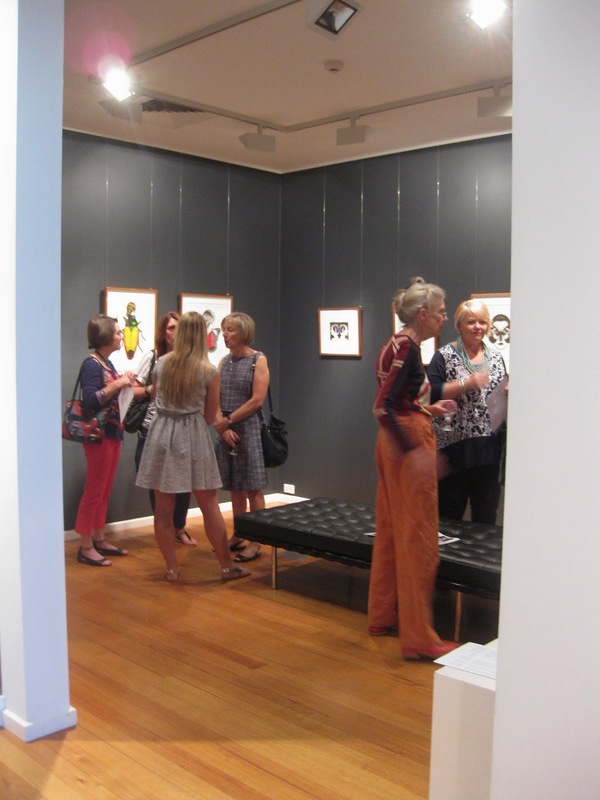 The aforementioned Homo-insecta relief prints were exhibited in the eponymous solo exhibition at the Art Vault in Mildura from late November - mid December, where I also undertook a short but extremely productive residency. 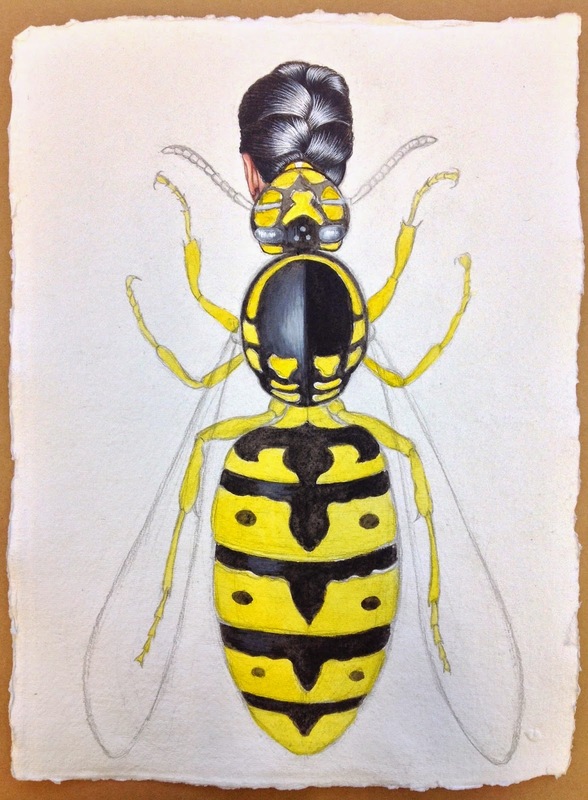 Although it’s fair to say that a substantial amount of time was devoted to print-based projects this year, equally as many hours have been spent honing my watercolour skills via the ongoing insect women series, the evolution of which has been documented faithfully on this blog. In the interim, other exhibitions I had work in during the year included: Show Time, The Arts Centre Melbourne; Seventh Skin, Hatch Contemporary Art Space, Vic; Corporeal (continuing) Switchback Gallery, Monash University, Gippsland,Vic; Prints 25, Print Council of Australia Prints, Whitehorse Artspace, Box Hill, Vic; We were only Wainting, I.D.E.A. Museum, Mesa, Arizona, US; Near Neighbours, St Heliers Street Gallery, Abbotsford and Solander Gallery Works on Paper, New Zealand. Goldfields Printmakers, Firestation Print Workshop, Melbourne, Vic; The 2014 Silk Cut Award for Linocut Printmaking, Glen Eira City Council Gallery, Vic; 2014 Fremantle Arts Centre Print Award, Fremantle Arts Centre, WA, PAGE.PRINT.POST., Post Office Gallery, Federation University, Ballarat, Vic; Contemporary Print, Australian Print Workshop, Vic; APW Print Fair, Melbourne, Vic; Biblio-Artist Books, Clunes, Booktown, Clunes, Vic. Looking ahead, in February 2015 eight of the Homo-insecta linocuts will be part of Editions 2015, a group exhibition at Tacit Contemporary Art in Abbotsford, Vic. In April/June the exhibition The Piano Has Been Drinking (Not Me) at Maitland Regional Gallery, NSW will include a drawing of mine made especially for the show. 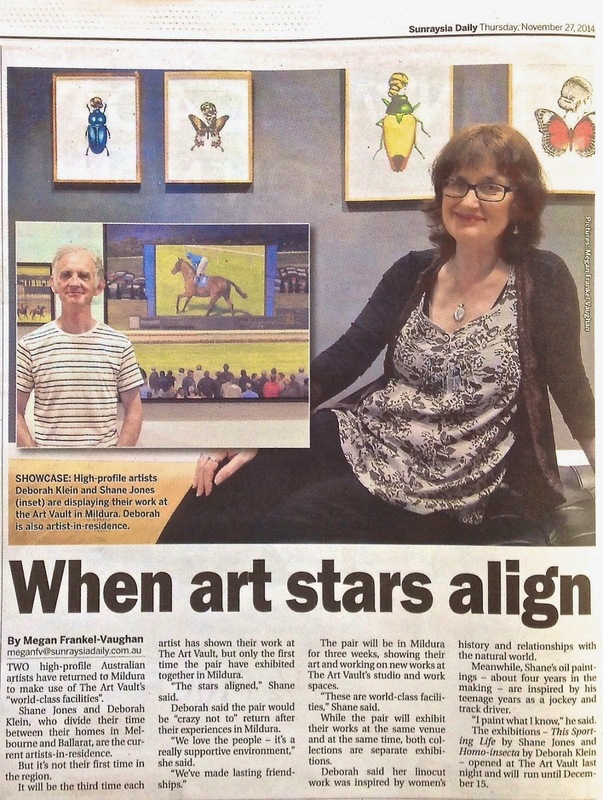 The Beastarium portfolio will be exhibited at Dubbo Regional Art Gallery in August 2015. Later in the year I'll be participating in a group exhibition titled Parallel Prints NZ/Aus 2015. 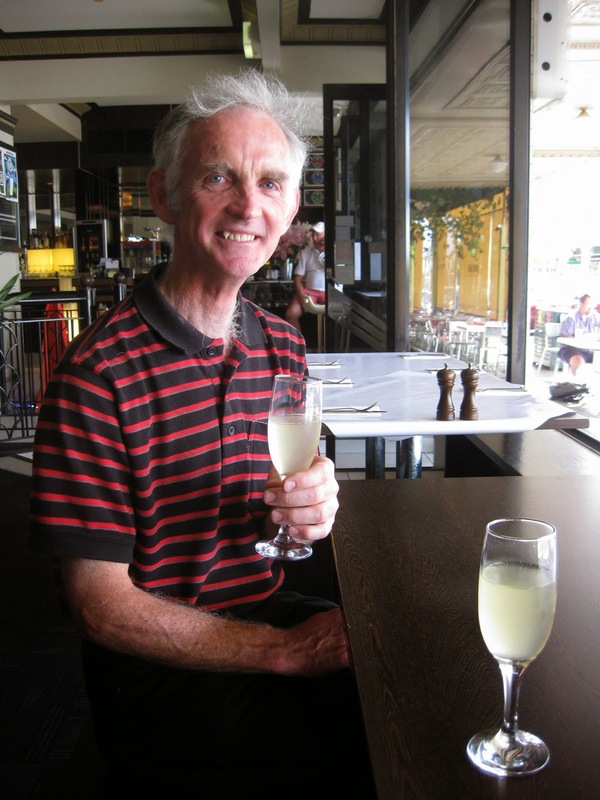 It's curated by Mark Graver, Director, Wharepuke Print Studio, Kerikeri, New Zealand. Full details of these will be posted nearer the times. Until then, I wish each and every one of you a very Happy New Year. With another busy year drawing to a close and Christmas Day less than 24 hours away, my list of the year’s highlights - of which there are many - is far from completed. With still a week to go before the year’s end, I suspect there are a few more highlights to come before the chimes at midnight on December 31. Meanwhile, I warmly thank everyone who has visited me here during the year. Thanks so much for your support and encouragement. I hope you'll drop by in 2015. When I’m in Mildura I never fail to visit Collins Bookshop, where I never fail to find at least one exceptional reference book. 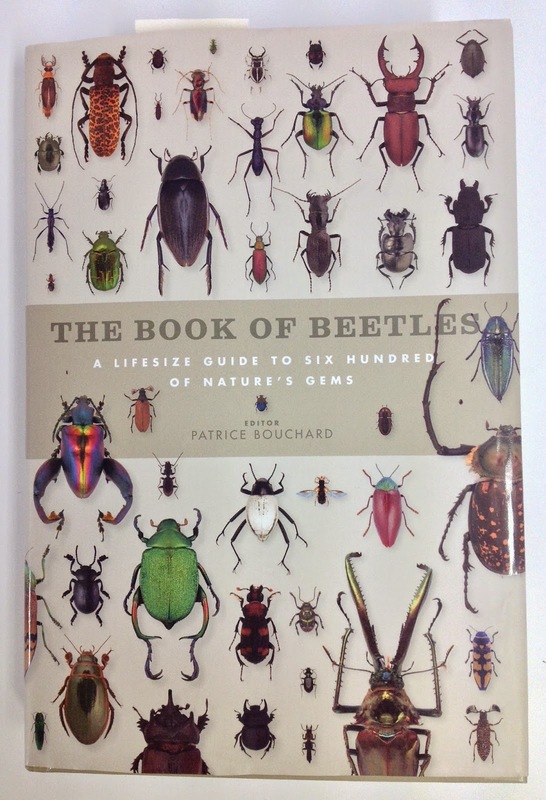 This time I really stuck gold: THE BOOK OF BEETLES A Lifesize Guide to Six Hundred of Nature’s Gems, edited by Patrice Bouchard and published by Ivy Press. The illustrations (at least those that aren’t too severely cropped) are of superlative quality. 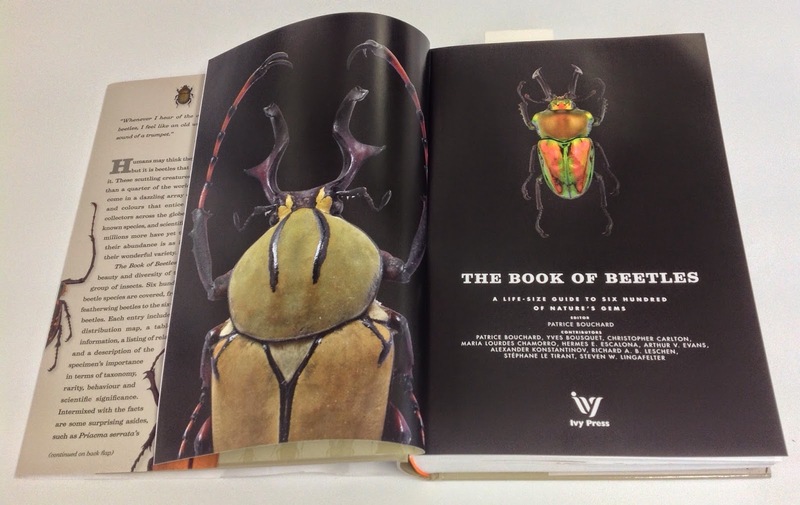 A case in point is Actinus imperialis, which features on page 182. Seduced by its science fiction Technicolour weirdness, the Doctor Frankenstein in me lost no time in transforming it into the equally lurid Actinus imperialis Beetle Woman. (See also previous Blog Post Wednesday, November 17: New Beginnings). 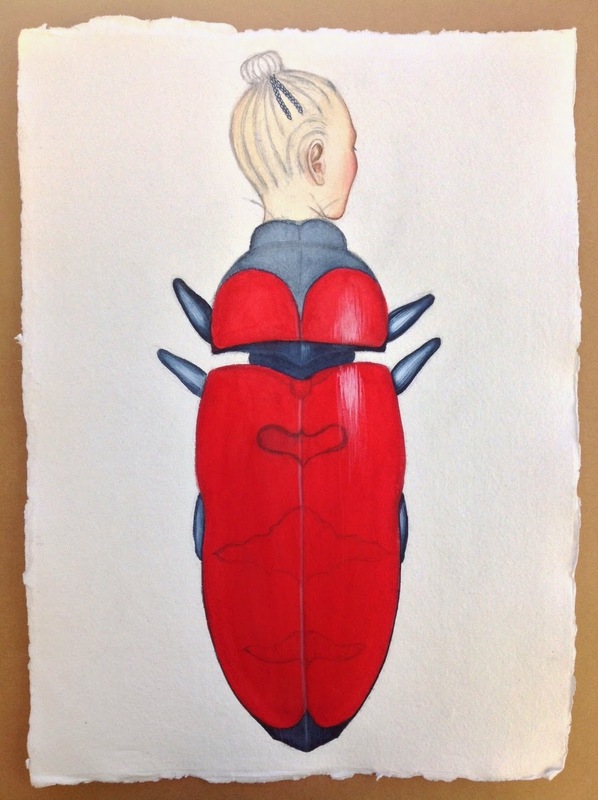 Pictured below: transformative stages of Actinus imperialis Beetle Woman, 2014, watercolour on Khadi paper, 41.91 x 29.72 cm. 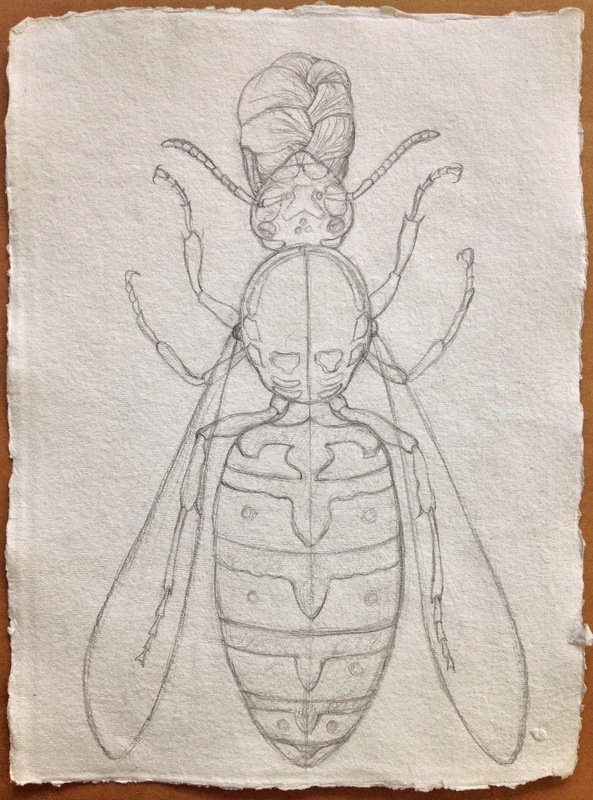 Refreshed and revitalized after my recent Art Vault residency, I've researched and drawn the outlines for three watercolours: Splendid Emerald Wasp Woman, Actinus imperialis Beetle Woman and Weavil Woman. With the intention of clearing the way ahead for the New Year and new challenges, I’ve also prepared several small wooden panels in readiness for the first works in the long-planned Homo-insecta mark 2, an ongoing series of paintings. The wood has been sized, rather than gessoed, in order to preserve the natural woodgrain (which will serve as a background to the imagery) and prevent the surface from darkening with age. 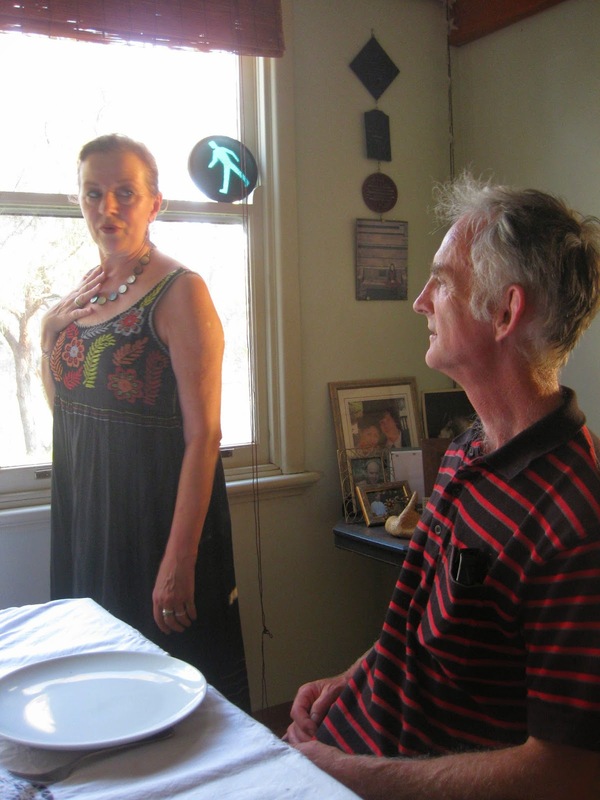 One of many happy memories from our Art Vault residencies/exhibitions (which officially end today) is the evening Shane and I spent with Anne Spudvilas. Her house is in nearby Wentworth, which is situated at the junction of the Murray and Darling Rivers. Chez Spudvilas is a singularly special place. 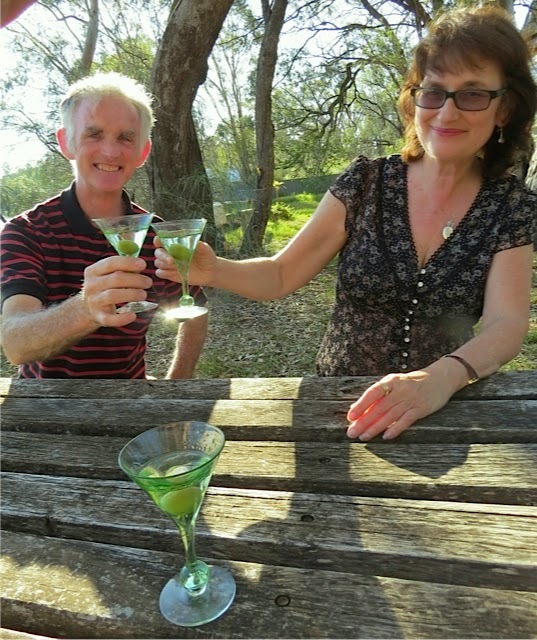 Upon our arrival Anne made martinis, which she served in elegant green art deco glasses. We sipped them by the river’s edge, savoring the taste and the view before going inside to enjoy the fabulous meal Anne had prepared for us. Anne is a former Art Vault artist in residence, who fell in love with the area - and stayed. Her experiences are documented on her blog Another Year on the River, which you can find on the right of this blog under Favourite Blogs. Alternatively, you can visit it HERE. 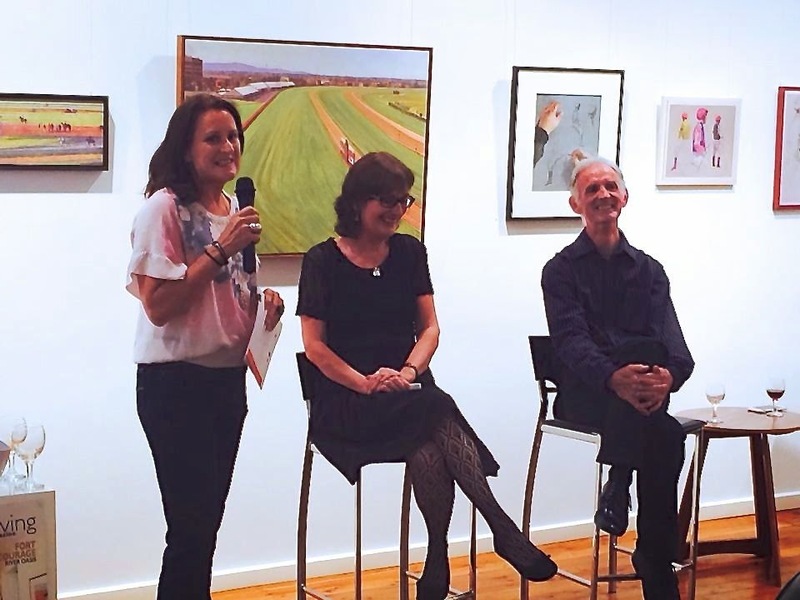 Last night I attended the Artists Party at the Australian Print Workshop, thrown by the APW as a thank you to the artists who participated in the IMPRESSIONS 2014 fundraising exhibition. Is it really two years since the last IMPRESSIONS Artists Party? 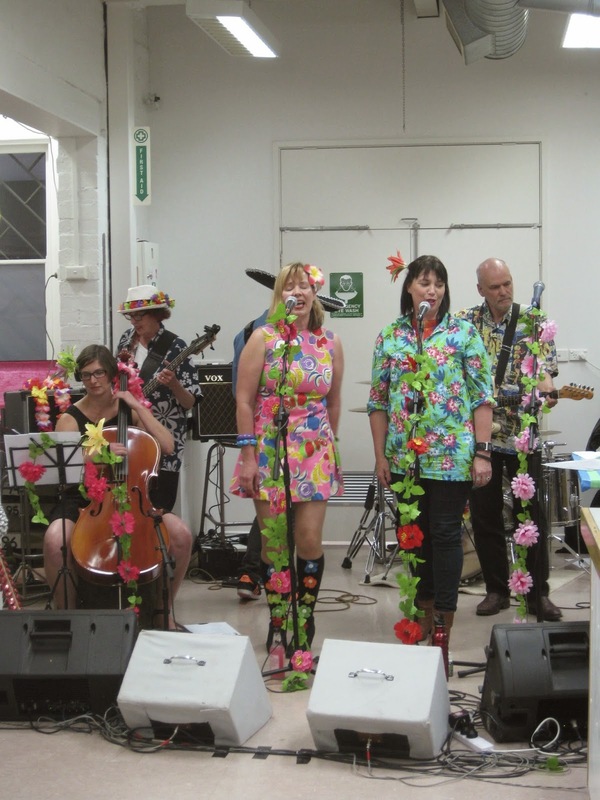 As in past times, the stupendous APW band The Press Gang provided the evening’s highlight. All of them are fine printmakers and equally accomplished musicians. When they were handing out the talent, these guys obviously stood in line twice. There was also much merriment during the announcement of the coveted Door Prizes. Two lucky recipients are pictured below, centre. 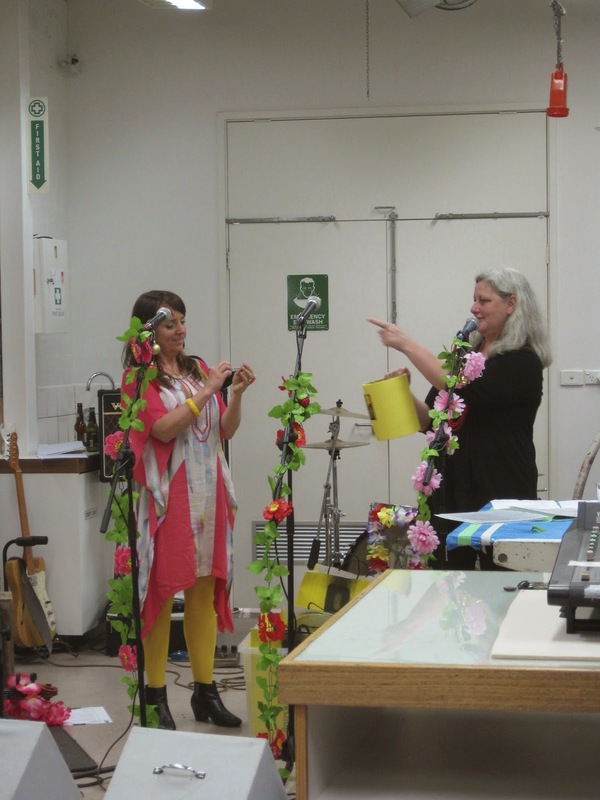 APW Band drummer Adrian Kellett (that stylish headgear is his prize) and next to him, a blurry Judy Holding hears her name announced and eagerly moves to claim her prize. Far left is Press Gang keyboard player, Raymond Carter. As always, it was a delight to catch up with Jade Kellett and Ray. Behind them, centre, is Brian Pieper. Later I had a lively chat with Lesley Duxbury, a terrific artist and an old friend who was once my boss in the RMIT Printmaking Department, and John Wolseley, a longtime favourite artist. It was a lovely way to end the evening. I couldn’t decide which shot of them I liked better, so decided to include both. Aside from some minor finishing touches, the second work I made at the Art Vault is also done. What a touchy subject she proved to be. 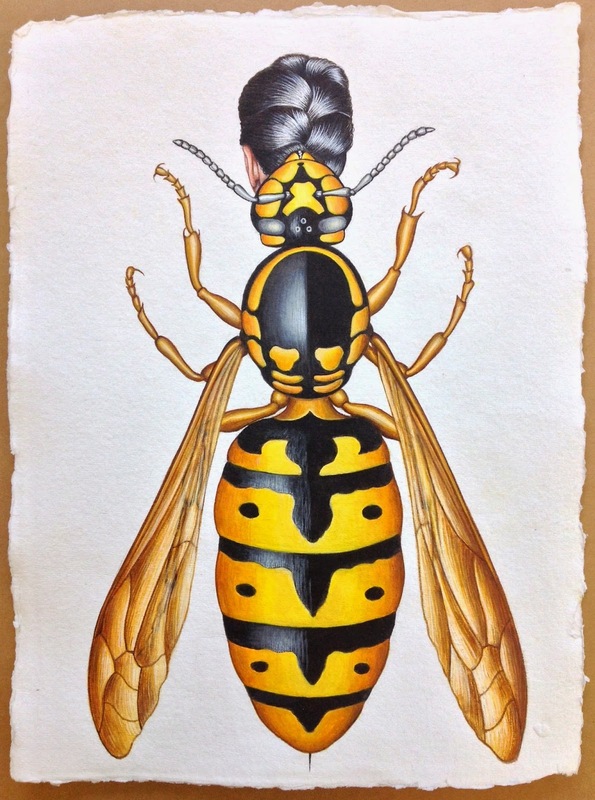 The European Wasp Woman is arguably the feistiest of all introduced species. Beware the sting in the tail of this femme fatale of the homo-insecta world. Unlike honeybees, which die after they have stung once, most wasp species will sting over and over again, just because they can. 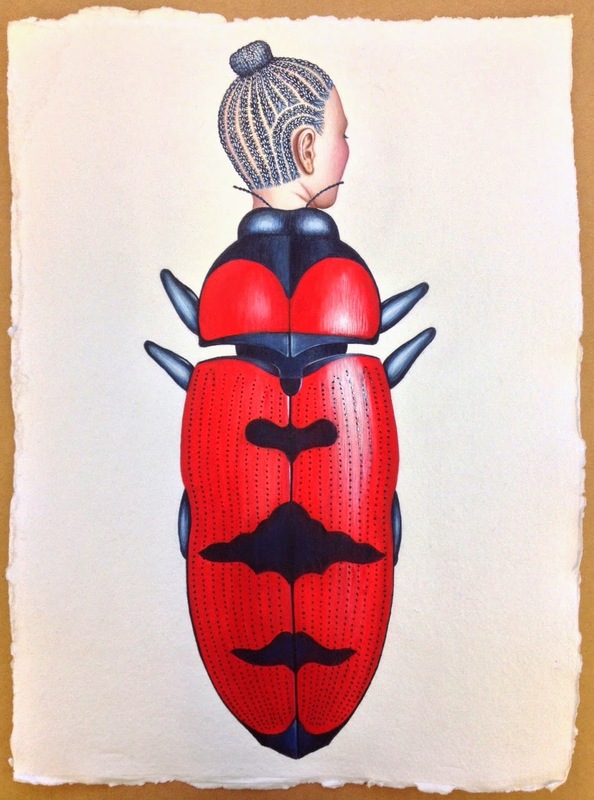 Rainforest Jewel Beetle Woman, 2014, watercolour and pencil, 41.5 x 30 cm. 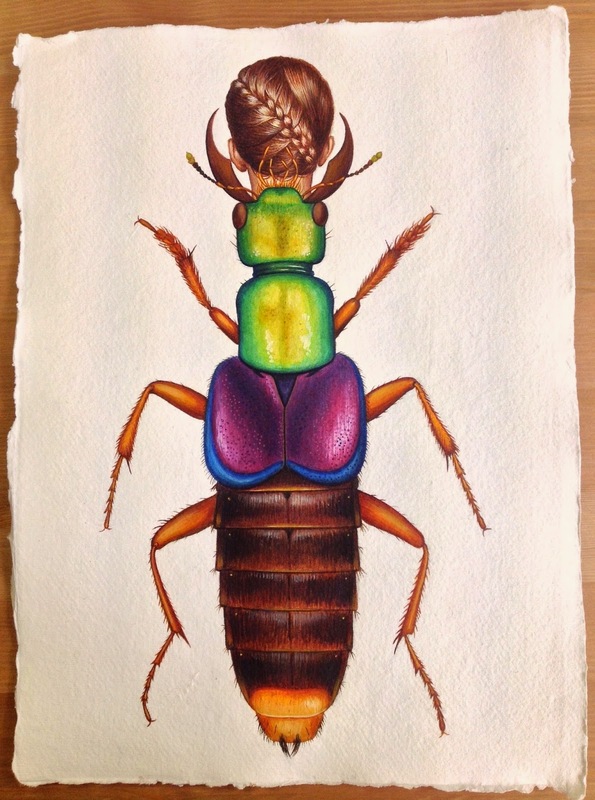 As noted in my last post, the watercolour Rainforest Jewel Beetle Woman was the first project I undertook as Artist in Residence at the Art Vault in Mildura. 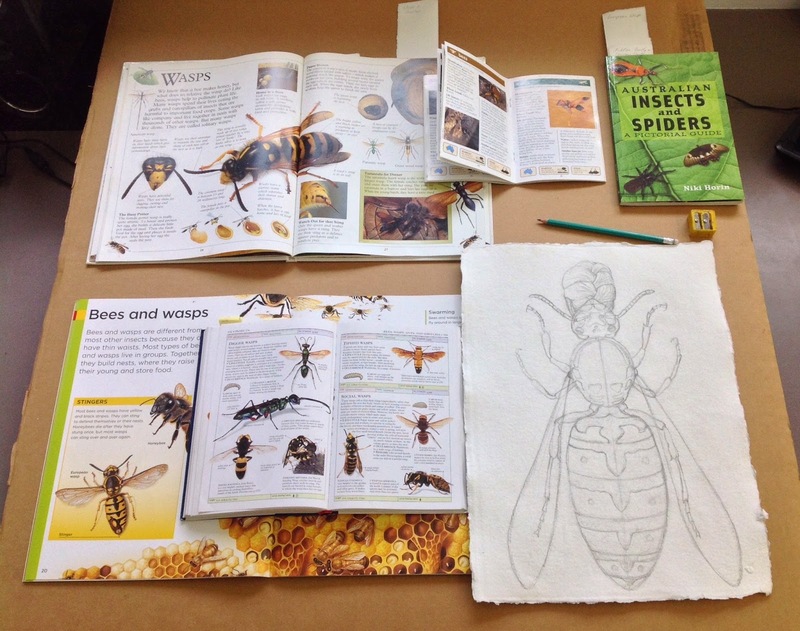 The finished work is pictured below, followed by some snapshots of the work in progress. A couple of months back, Kate-Gorringe Smith, Acting Editor of the Print Council of Australia's quarterly journal IMPRINT, contacted me and asked if I would write an article on my books and zines for the summer edition. As good timing would have it, the issue in question (volume 49, number 4) has just been published; it complements perfectly my current exhibition at the Art Vault, as it discusses in part the unbound artist book Homo-insecta, selected works from which are exhibited in the show. 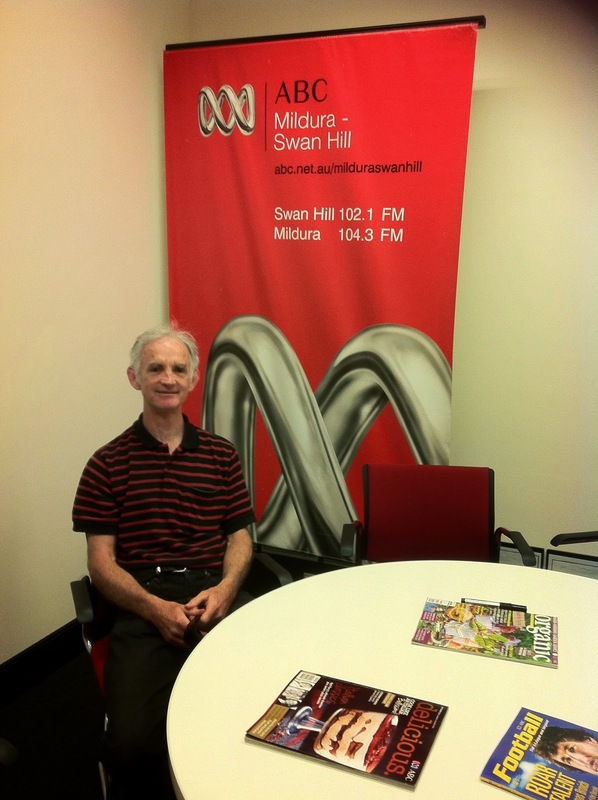 Following are just some of many highlights of our return to Mildura and the Art Vault. We arrived on the afternoon of November 24. After reuniting with the fabulous Art Vault crew, placing our work around the two gallery walls prior to the hang of our shows and unpacking, Shane and I celebrate our return with a glass of Prosecco in the elegant art deco surrounds of the Brewery, which, in bygone days, was a picture palace. The evening of November 26: now comfortably settled back in our apartment, we prepare for our exhibition opening. …and me with the Art Vault's Sonja Hodge. 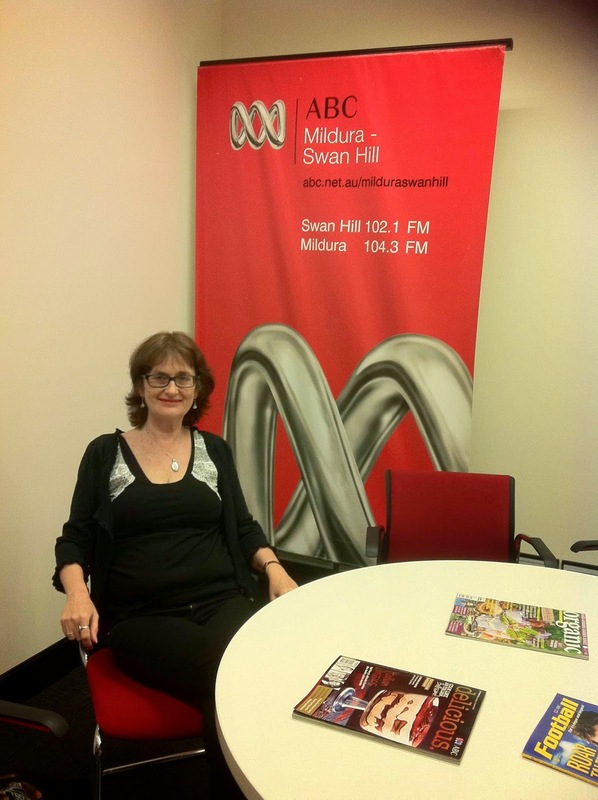 Our show was launched by local writer/composer Helen Healey. The opening event took the form of an informal discussion, primarily about the importance of drawing in visual art. In the background of this and the following two shots are Shane's paintings. Then the opening got under way. My work is exhibited in Gallery 2. Then it was back to work. 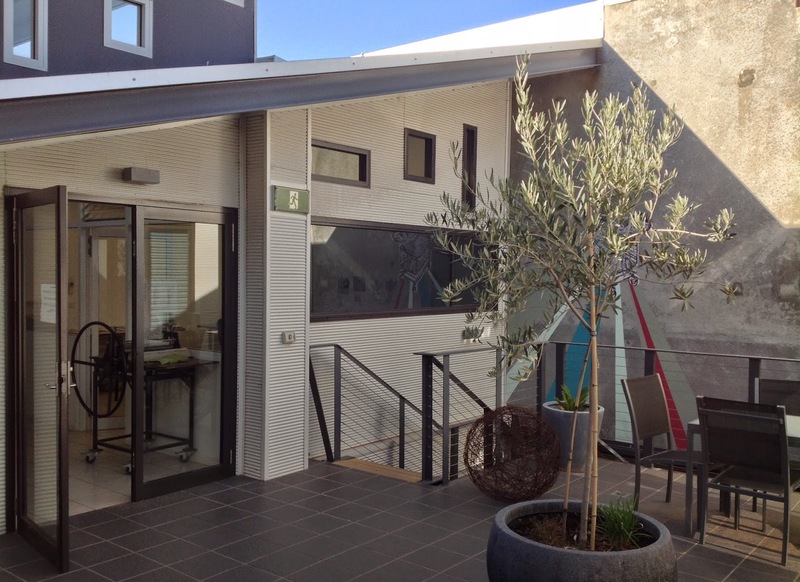 Studio 10, one of two studios allocated to us, is directly across the courtyard from our apartment. 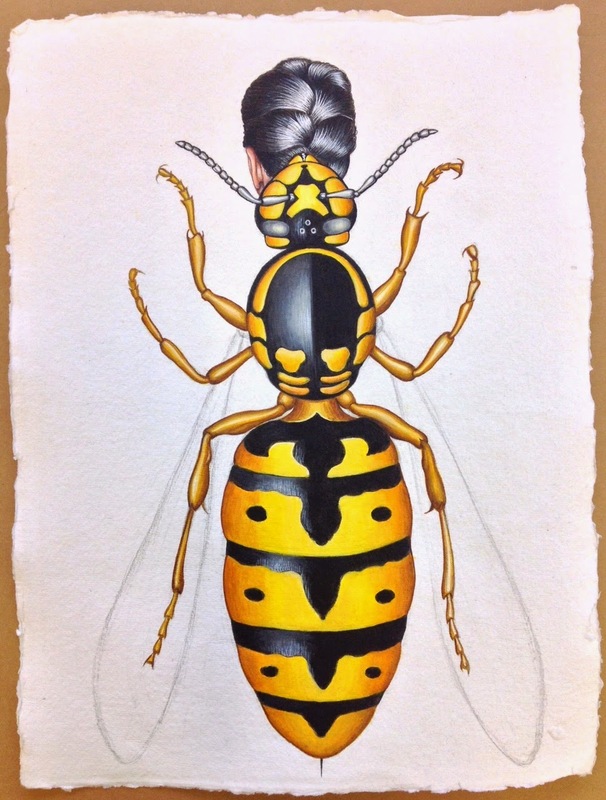 …and my second watercolour in progress: European Wasp Woman. A full house: Shane and I pictured with the entire Art Vault team. From left: Mia, Andrew, Shane and I, Julie, Robert, Sonja and Anne (she set the timer on her camera). Shane's racecourse paintings grace the walls above and below.